Popularized by the people of the Ligurian region of Italy, pesto is a flavorful combination of 5 simple ingredients; fresh basil, pine nuts, extra virgin olive oil, Parmesan cheese and garlic. Our authentic Alessi Pesto is made using an old family recipe and only the finest ingredients. Most competitive brands replace extra virgin olive oil and pine nuts with less expensive oils and nuts dramatically changing the flavor. 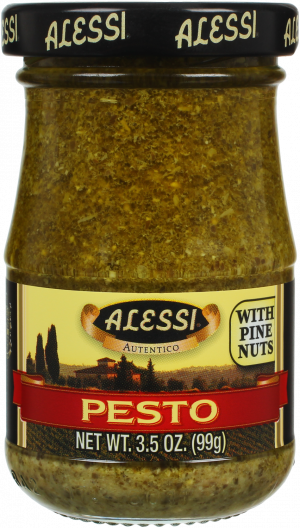 But Alessi Pesto is authentically Italian. Enjoy Alessi Pesto over pasta (spaghetti, linguine or gnocchi), or as a spread on focaccia or in dips.